8 1/2" Chelsea Type B 12/24 hour Engine Room Clock in a black phenolic case with black dial, Arabic numbers and spade hands. The eleven jeweled escapement, Model 12E movement also features a jeweled fourth wheel. Dial is marked with “US Navy” and serial number 406764 marking its authenticity. 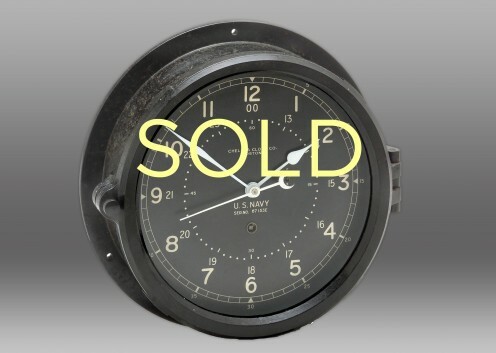 Chelsea factory records indicate this clock was shipped to the U.S Navy Department on November 18, 1943.